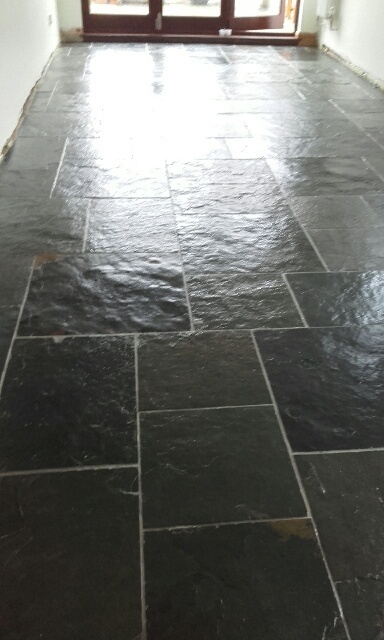 I recently received call from a customer who wanted me to have a look at their slate floor in their kitchen and see what I could do with it. They were in the process of having a new kitchen fitted and were contemplating ripping out the existing slate floor and replacing it with something else. 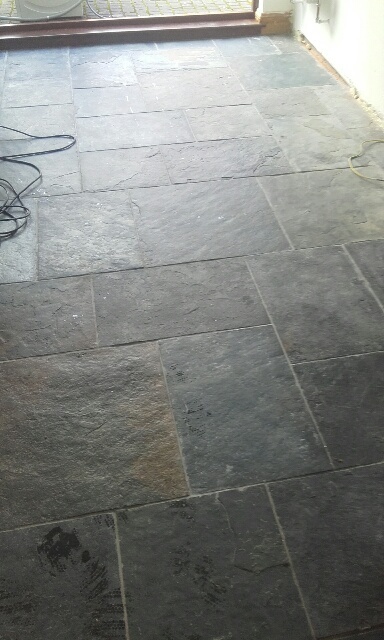 The reason for this rather dramatic option was that they had tried numerous different products and methods on the slate floor but each time it remained lifeless and dull. 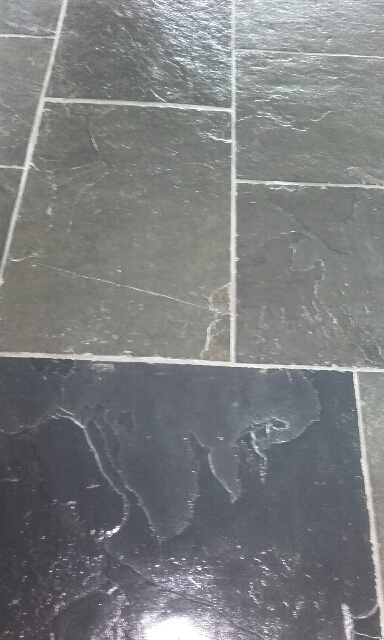 I did a small test patch and established that the existing seal could be stripped off together with some grout haze and that the colour of the tiles could be brought out. I spoke with the customer about what type of finish she wanted and explained the various options available and the pro’s and con’s of each. She was adamant that she wanted a dull natural finish so I sealed some of the cleaned floor with an impregnating colour enhancing seal. For a comparison I did a couple of areas with a topical seal that has a sheen to it. I then left it with the customers to decide what they wanted to do. I received call the following day to say that they wished to go ahead and that they wanted the topical seal. 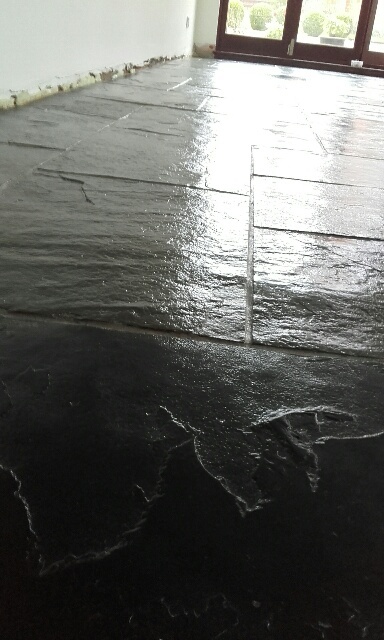 The floor was duly stripped and cleaned and initially two coats of seal applied , which gave a light sheen to the floor. The customer then advised that she now wanted a deeper shine and so two further coats were added. 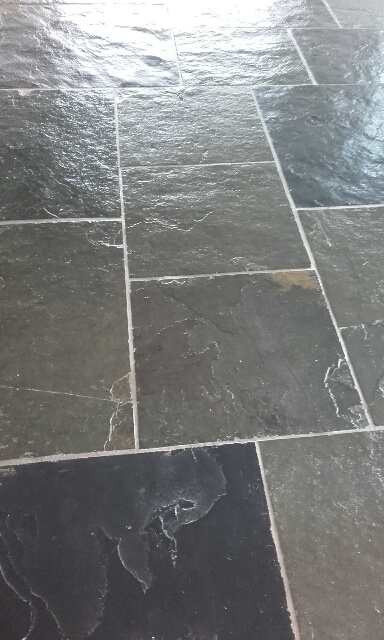 The floor is not as shiny as it appears in the photo’s but does have a deep sheen to it and also has the benefit of being very easy to maintain and offering great protection to the stone against oil and other spillages. 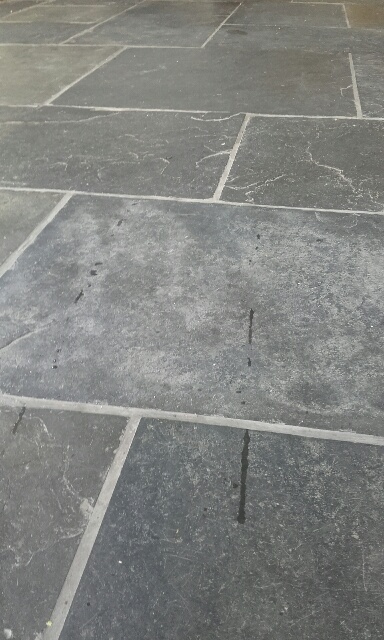 Just seen the effect you can make on slate floors. I have inherited a very old, reclaimed terracotta tile floor which I would dearly love to restore . . . Do you work with terracotta? I can send photos if this is helpful.